Theme is among the most mysterious and powerful elements of storytelling. 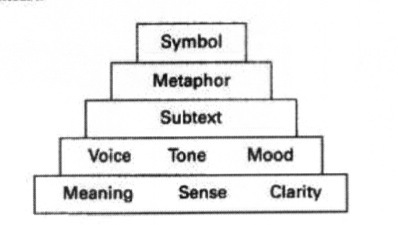 In the classic pyramid of writing skills from the Iowa Writer’s Workshop, theme stands at the pinnacle. Theme is represented by symbols in that pyramid, the icons such as candles in a story about being lost. Even though it’s at the top of that diagram, theme is the nuclear reactor, the molten magma of your story. It’s also got another superpower. Theme, and knowing yours, makes writing your queries easier. If you’re just writing for the first time on a story, book, or script, theme will be lurking under the surface. Your motivations for your characters are your primary concerns in early drafts. The needs and conflicts of the characters drive your plot. Remember that plot is about events, and story is about yours characters and how they change. When you consider what each character needs, you may find the needs can align around a bigger idea. Freedom. Justice. Redemption. That sort of thing. Some characters oppose the theme to provide conflict, too. The Da Vinci Code is about the power of knowledge versus the power of the Church. The Great Gatsby is about the American dream and how it fails. Your theme can be downbeat as well as uplifting. Lonesome Dove is about the power of friendship and it can push a man across a new frontier of his life. The gift that theme gives to query is better focus. In a good query letter you have to sum up your story relentlessly. What’s the book about? You begin the task of answering by writing a synopsis. Then it becomes a paragraph. Finally, it’s tight enough to state in a single sentence. It’s hard to do, but you’re the best person to find your theme. You’ve lived with the story longer than anyone. You knew what you meant to convey with your book. Not the telling part; that’s plot. You want to convey a feeling, because the feeling is central to unlocking the meaning of the story. Theme usually emerges later in the creation process. It’s almost like you have to write a draft all the way through to understand what you were meaning to show with the story. Theme then becomes a good tool to polish and pare down and redirect a story. Answer these questions to discover a theme under the surface of your storytelling. What stories are you drawn to the most? What issues do you struggle with in your own heart? Why do you feel compelled to tell this story? Your characters’ voices will sound clearest when you listen for theme. Let them report on the theme. Write what they’ll ask about their challenge. Early on in my writing life, I was sure that the synopsis was the key to earning a publishing deal. But a synopsis of 4 to 16 pages is too long for most agents to read. What these gatekeepers of the publishing world start with is a query letter. It’s a business pitch, even if it promotes an artistic product. If you haven’t sent off your query yet, here’s the best description of every aspect of how to craft a query letter. Noah Lukeman has three fine books for writers, such as “The First Five Pages: A Writer’s Guide to Staying Out of the Rejection Pile.” His latest is “A Dash of Style: The Art and Mastery of Punctuation.” And as a agent he’s read 100,000 query letters. His Amazon Shorts book is a gift back to the writing community, available on Amazon as a free PDF file. Yes, they ask for credit card data, but the charge is $0.00. It’s a digital file, so there’s no shipping. Get your free copy today. I was pretty sure that a query letter was single-spaced. Lukeman confirms this. He also calls the letter a marketing task, but perhaps the only piece of writing you will ever get an agent to read. Marketing can be learned, he says. Easier than artistry, I add. From Making the Perfect Pitch, edited by Katherine Sands, this is Kristen Auclair’s article about five crucial questions to answer before that query letter of yours goes into the mail or e-mail. 1. Is the book polished, error-free and professional? 2. Does the tone of your query letter reflect the tone of your book? 3. Are you sure the agent you’re pitching works on this type of project? 5. Are you emphasizing the best aspects of your project? The best aspect about this helper book is that it’s written by a host of publishing professionals, with lots of Sands’ writing in between. Auclair is a literary agent at Graybill & English in Washington, DC. She’s handled both non-fiction and fiction projects. The Kristen Nelson Literary Agency has a helpful newsletter for the writer who’s nearing a query letter date. That’s the deadline I’m approaching for Viral Times, once the revisions are finished. One of the agents at the Nelson Agency offered this advice about writing the query. Advice of this type often tells a writer not to do silly things, like mail chocolates along with a letter. But at least the agency’s Sara Megibow (at left) affirms some things you should do in a query to an agent. State that you found our agency through agentquery.com or Preditors and Editors, or aar-online.org, etc. Repeat your contact information right in the body of the query letter (you can hardly ever put your name, title of work and email address in too many places). These are all things that one might do in a job interview too, and following these guidelines always come across as professional to me. Out on the Writer’s Digest blog, a novelist writes a story about his friendship with an agent. Before long it becomes a career prospect. She finally asks when she can read his work. He decides to give her an exclusive look as his first attempt to land an agent. Problem? She is new at agenting, in the middle level of a small agency. Crazy, says his friend. Get all the money you can. Good business. Good advice if your writing is a business at its core. Nothing wrong with building a retirement and healthcare nest egg. But at the start of your career — and it’s obvious from the blog that our writing hero is just starting, “defending my MFA” in the spring — smaller can be better. More attention, the start of a beautiful friendship. A writer friend of mine went to the Writer’s League of Texas Agents Conference last month. She pitched in a formal 10-minute session, but her most significant pitch came at breakfast. Casual, while she told the story of her story. “Is is finished?” asked the agent. Those magic words, delivered over a personal meeting. If your (fiction) book is done don’t wait. Send, if you hear those words. And keep an eye on the potential for a relationship when you send. This is like hiring a doctor or a therapist or an accountant. Someone who can make a difference in the quality of your life, business and writing, too. In the movie business, scripts are sold by way of the pitch. This is also a tool for writers in other genres, like creative non-fiction and fiction. The Writer’s Digest Guide to Literary Agents offers this advice about the pitch — the most essential part of a query letter. And the advice is pitched with examples of movies. Do talk about publicity and platform if you are writing nonfiction. Don’t let your pitch run wild. Seven sentences is pretty long. Aim for five. Don’t spend time on the main characters or tell every character’s name. If you can pitch without even saying the name of the antagonist or love interest, it’s less confusing. Don’t give away the end. Pique; do no more. Don’t pitch agents about poetry or magazine articles. Don’t pitch if the work is unfinished. Don’t hand the agent anything. They will request more if interested, and they will give directions on how to send your sample. GLA also takes apart a query letter that goes wrong on the GLA blog. It’s worth a look to see what not to do in a pitch and query. But that next to last DON’T is important. There’s no point in a pitch for a novel if the work is unfinished.